Founded in 2002, SalesBrain has helped over 600 companies worldwide and trained over 120,000 executives. Christophe and Patrick's unique, award-winning NeuroMap™ offers an easy to follow, 4-step methodology to improve marketing and sales processes. With the NeuroMap model, you can scientifically capture, convince and close more customers. What Christophe and I discuss in our podcast is how to truly get your message understood by the brains of your customers. And this is not as hard as you might think. As Christophe explains, most of our efforts to convince or persuade are ineffective, and traditional types of research, surveys, interviews and focus groups do not get at the mechanisms underlying why we buy. Why? Because your brain rejects messages that interrupt it. It is the subconscious and preconscious functional circuits of the brain that navigate our responses to stimuli—marketing and otherwise—and it is the oldest, reptilian part of your brain that drives your decision-making. This means that when you are trying to influence someone, you must focus on what they are hearing, not on what you are saying. Listen carefully to this podcast and you will learn how you, too, can better influence and persuade others. Who knows how far this will take you! As CEO and Chief Pain Officer of SalesBrain, Christophe is passionate about understanding and predicting consumer behavior using neuroscience. Before joining SalesBrain, he was Chief Marketing Officer for rStar Networks, a public company that developed the largest private network ever deployed in US schools. Previously, he was VP of Marketing and Corporate Training for Grocery Outlet Inc, the world's largest grocery remarketer. Christophe has received multiple awards during his career, including two prestigious speaking awards from Vistage International and three Great Mind Research Awards and Distinctions from the Advertising Research Foundation (ARF). For a consultation on how to identify and overcome your customers’ pain, you can reach him at christophe@salesbrain.com. 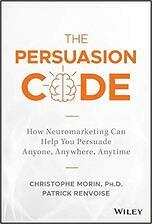 Christophe's book: "The Persuasion Code"